A world sunlight map: you can watch the sun rise and set all over the world on this computer-generated illustration of the Earth’s patterns of sunlight and darkness, in real-time. Provided by die.net, which hosts collective ‘net projects of a few dozen friends in the United States. You can access the world sunlight map by clicking here. 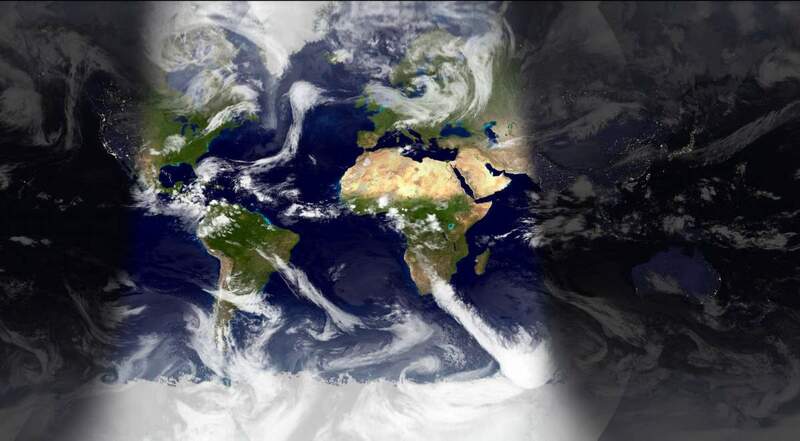 Here is a sample view of the map below, which is showing the sunlight pattern of Earth on October 5, 2015. A world sunlight map provided by die.net. In the map above, Mercator projection is used. It is a cylindrical map projection presented by the Flemish geographer and cartographer Gerardus Mercator in 1569. It became the standard map projection for nautical purposes because of its ability to represent lines of constant course, known as rhumb lines or loxodromes, as straight segments that conserve the angles with the meridians. The clouds are updated daily with current weather satellite imagery. On die.net, it is also available a semi-realistic view of dawn and dusk from far above the Earth, a look at the moon, and information about how the world sunlight map works.